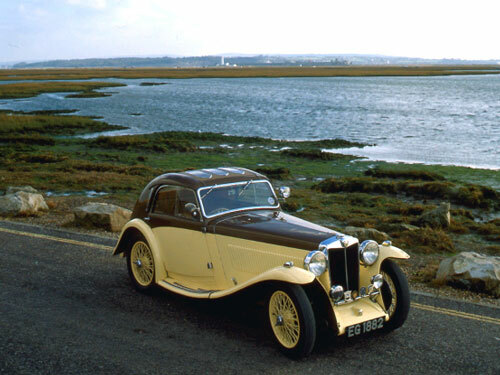 The name Magnette was first used on an MG by Cecil Kimber in 1932 when the K series of cars were announced. The designation Magna preceded the Magnette range, first appearing on the F type in 1931. The F type in particular was derived from the C and D type Midgets that were launched in the same year. It is from the Midget, Magna and Magnette range of MG's that the terminology, Triple M cars originated. The advent of the Magnette name on the K series cars heralded the arrival of the 'Light Sixes' as they became known. The heavy 18/80's were nearing the end of their useful production life, although they still appealed to the more wealthy MG fraternity. 6 cylinder engines were very popular in the decade 1925-1935, simply because the 4 cylinder engines of the period were very harsh running units. This harshness became accentuated by the use of solid engine mounts direct onto the chassis. This coupled with non-synchromesh gearboxes, heavy clutches and weighty flywheels all added up to a less than satisfactory package. Low engine speed emphasised the unevenness of the 4 cylinder engines and constant gear changing made driving a bit of a chore. Hence the attraction of the 6 cylinder engines which had been successfully adopted by some of the European manufacturers who had discovered that the formula of low geared, high revving engines, driving large bodied cars was a winning one. The six cylinder cars were to be produced in relatively small numbers compared to the Midgets of the era as they did not generate quite the same affection. Performance wise, although very smooth, they dlid not give the same exhilaration as the smaller MG's. The first Magnette announced at the 1932 Motor Show was to form an important part of MG history and was the basis for an out-and-out racing model. The K series were to embrace the most renowned MG model of all time the K3 racer, a car that was to bring worldwide fame to the Abingdon factory. This car was powered by a 1087cc KB type, six cylinder engine that gave Cecil Kimber his much desired entry into the 1100cc Class of racing. The chassis was of conventional MG design, although the track, wheelbase and width were all increased over the previous Midgets and Mag-nas which allowed much more interior space in either open four seat touring form or as a four door pillarless saloon. In 1933 the Magna range was updated with the introduction of the L type which carried an engine derived from the KB unit. This became known as the KC engine and had coil instead of magneto ignition and twin carburettors. The engine was of shorter stroke which at 57mm x 71 mm was identical to the racing Midgets of the era. At this time there was a lot of development work going on at Abingdon, particularly in regard to their racing involvement. This development had to be paid for and was ultimately reflected in the prices of the end product and made the already expensive Magnettes even harder to sell. Although the Abingdon expenditure was relatively modest in terms of competition victories, the concentration of effort on this side had been at the expense of fulfilling the market needs. Therefore in 1934, the MG range was slimmed down and the P type was introduced to replace the J2 which at the time was the mainstay of the range, despite serviceability problems with the two bearing crankshaft that had a habit of snapping in two at high engine revs. This new Midget arrived in February of that year closely followed in March by the new N type range that was to replace the Magnas and introduce some standardisation and rationalisation to the range. The N types departed for the first time from the standard 'ladder type' frame chassis with the side frame members being wider at the rear than at the front. There was also a new innovation with outrigger members being mounted on Silentbloc rubber bushes. These were fixed to the side and rear of the main chassis and carried the body which resulted in a more comfortable ride. The first N type became designated the NA and was available either as a two seater or four seater open tourer with the usual distinctive slab type petrol tank being disguised behind a very elegant swept tail that incorporated a semi recessed spare wheel. Very soon after its launch, specialist coachbuilders announced their variants of the car. Firstly, Allingham produced a body that resurrected tine previously fashionable dicky seat and Carbodies had full factory backing for their Airline Coupe. The Coupe was a very attractive car and Carbodies had certainly proportioned the body well to compliment the NA chassis. It is estimated that only about 7 of these Airlines were produced, making them an extremely rare car. Also a rarity was the ND hybrid which made use of redundant K2 bodies mated to the N type chassis and in similar fashion, surplus K1 pillarless saloon bodies were attached to the N type chassis to form what was known as the KN saloon. It was a modified version of the KD type engine that was to power the N series. This unit had a displacement of 1271cc and a power output of 56bhp at 5,500rpm. Modifications were fairly extensive involving the cylinder block, cylinder head, inlet manifold, oil lubrication system and clutch. These modifications introduced a 25% power increase over the KD unit on which it was based and gave the N type quite brisk performance. The gearbox was very similar to that used in the L type being non-synchromesh and having a reverse gate. Different ratios however were employed giving lower ratios in first and second and higher cruising ratios in third and top. In 1935 the mechanical specification of the NA was altered with a close ratio gearbox being fitted whilst body changes included the lowering of the top scuttle and the fitting of forward hinged doors. A slatted radiator similar to that employed on 18/ 80's and the PB was fitted to distinguish it from its predecessor. This new version of the N type was configured the NB and was in production for most of 1936 being the last of the overhead camshaft models to be produced before the introduction of the VA one and a half litre model that sported a pushrod overhead valve engine.